Holiday Rentals Malves En Minervois, Castelchambres, Hébergement Dépendances Du Château De Malves, Aude, Batîsse Xiii°. 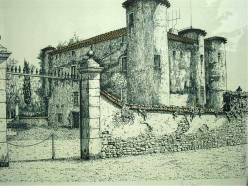 Castle Malves in Aude Cathar Country, XIII ° century building, near Carcassonne, Guesthouses, furnished Studios Tourism and Collectives. Located 10 km from the medieval city of Carcassonne, 5 km from the Canal du Midi, the two sites classified as World Heritage Site, near the Gulf of Caprespine and Caves Limousis.